Sleep is critical, especially in outdoor activities. That is why selecting a sleeping bag that will serve your sleeping needs is a key preparation. Sleeping bags have 2 significant aspects in multi-day outdoor activities: replenishing stamina and increased weight load. The former is an input of stamina while the latter is output. 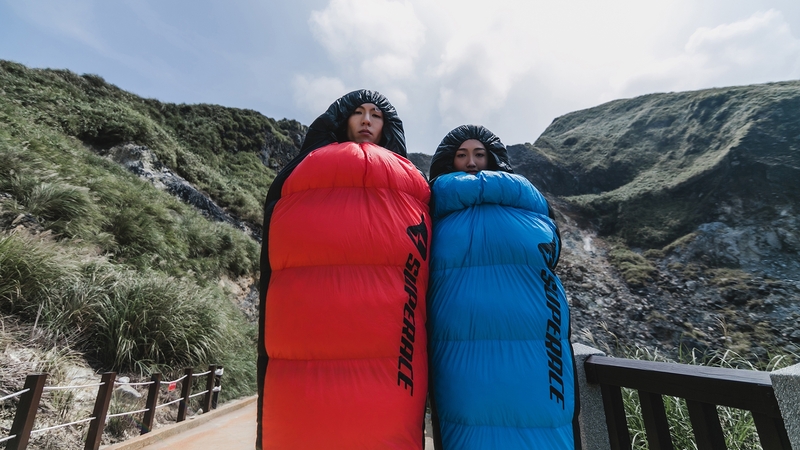 For super marathon participants and mountaineers who must diligently weigh every ounce of stamina, a truly superior sleeping bag must provide good sleep quality (higher input) so you can begin each day well rested while also being small and lightweight to reduce burden while carrying (low output). How warm is a sleeping bag? The most direct method is referring to the suggested temperature on the label and comparing that to your usage scenario. There are some additional details that allow you to further evaluate the warming performance of a sleeping bag. 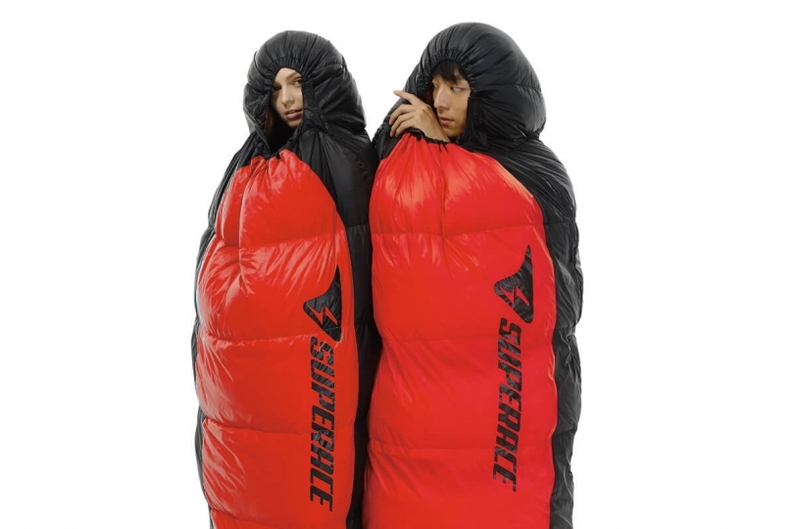 Mummy-style sleeping bags adhere to a person’s body shape. Compared to common “envelope style” sleeping bags, mummy-style are wide at the top and tapered at the bottom with a wrap around the head. The superior coverage provides the warmth of sleeping in your mother’s arms. One of the keys in selecting a sleeping bag is the content. There is much know-how in this regard and down is a common material in addition to synthetic fibers as it is lighter, has superior heat trapping capabilities. It is a higher-grade material. Another method is considering “fill power” (FP). Professional speaking, it’s an evaluation of how “fluffy” it is as types of similarly weighing down that can expand to greater volumes represents higher fluffiness. This means there will be more space between the down to trap air, keeping you warmer. For instance, 650PF is warmer than 550PF, while 800PF is much warmer than 550PF. In addition to keeping warm, breathability is also key similar to how we select functional clothes to keep us warm during winter. Taiwanese down supplier Hoplion developed one of the world’s top 3 down materials: 37.5® Down. This revolutionary down formula = active particles + coconut fiber to achieve a moisture release speed that is 40% faster so that at night, moisture is expelled from your body while external moisture is not absorbed. This effectively protects against moisture to maintain the necessary warmth of a sleeping bag. However, keeping warm is not enough! Imagine sleeping on a hot scouring pad. Your body will hurt each time you turn so even if you’re warm, you won’t be able to enjoy a good night’s sleep. What I’m saying is that a comfortable fabric is also highly critical. We can’t simply use the standards of “picking out clothes” when selecting the external fabric of a sleeping bag, but must also consider warmth, ground surface dew, and protection against water. For instance, SUPERACE 37.5® PERFORMANCE sleeping bags use high-density fabrics treated for resistance against splash so that down can maintain fluffiness and keep you warm longer. You won’t have to worry about moisture getting in at night (your body temperature drops while sleeping so if you’re not protected against external moisture, temperature loss will occur!). A sleeping bag must follow you across the wild so in addition to keeping you warm, it has to be “lightweight”; true consideration is letting you preserve your stamina! When traveling outside of cities, it’s definitely time to wait for magnificent views~ Having to worry about small matters such as comfort (survival) is bothersome…so for instance, wet clothes! While running or walking for several kilometers, your inner layers and bandanas will inevitably become wet. Those with experience on mountains know that when temperatures fall, moisture condenses and things you hang out to dry will become wetter. Your clothes may even freeze in a pile due to it being too cold…the best way is placing them in a sleeping bag and using body warmth to dry. SUPERACE sleeping bags are designed with an internal mesh pocket with straps that can secure wet clothing so you can lay clothes flat and not worry about turning or your clothes rolling into a ball at your feet. When not in use, you can place warm clothes inside to keep your core warm to increase performance in colder weather! SUPERACE sleeping bags contain other smaller mesh and zipper bags so you can place valuables such as smartphones or chargers (it’s important to remember that batteries will leak power when it’s too cold outside) in the sleeper. A key design conflict is: “weight”! (We’re back to that again, since you’ll have to run around with a sleeping bag in the wild!) Good but heavy design is not something people enjoy! Thankfully, SUPERACE 37.5® PERFORMANCE sleeping bags are less than 1 kg (even the large size is a mere 840g!). It’s about the weight of 4 dates and the length of an A4 paper so it won’t take up too much space in your backpack. 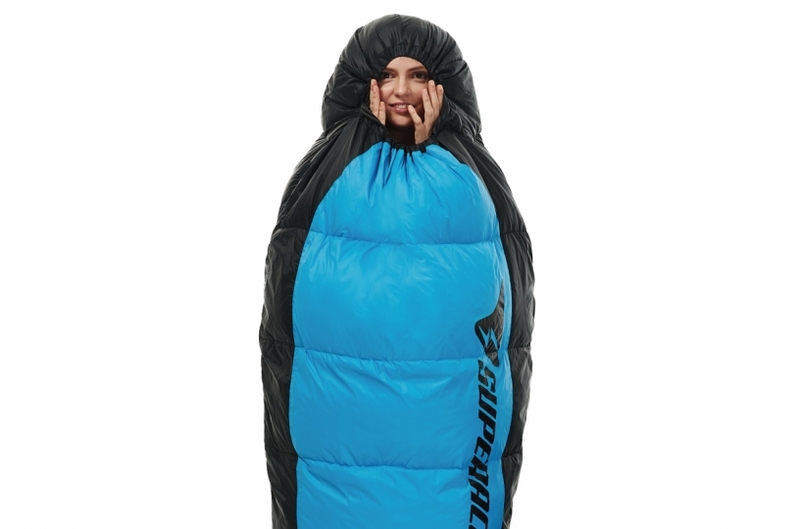 Basically, sleeping bags are your middle and external layers while sleeping. Selecting a good and suitable sleeping bag will let you sleep well at night and be fresh for the next day. It’s lightweight so carrying it around will not burden you, leaving more energy for you to better enjoy your journey!